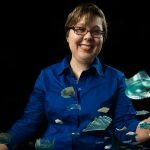 Dr. Allison Sterrett-Krause recently traveled to the 2st International Association of the History of Glass Conference in Istanbul, where she presented on recent research entitled “Reconstructing life from the litter in Pompeii’s Southwest Corner.” The lecture focused upon differing uses of glass objects between the city elites and those of lower social standing. This entry was posted in Faculty, Research and tagged archaeology, Classics, conference, Faculty, Research. Bookmark the permalink.